Cigarette smoking is a leading cause of numerous health problems and diseases, such as blood clots, heart disease, and cancer. Now, recent medical research has discovered a link between smoking and increased instances of Hair Loss. In 2007, Scientists in Taiwan completed a study involving 740 men who were suffering from premature hair loss or Alopecia. Both smokers and non-smokers were enrolled in the study and the findings point to a significant correlation between moderate smoking and hair loss. According to findings, men who smoke 20 or more cigarettes per day have a greater chance of developing baldness. These findings were determined after taking into consideration Family History Of Baldness, general health, Age, and other habits. Although an exact relationship between cigarette smoking and hair loss is yet to be found, evidence points to a disruption in circulation as a potential cause. For the hair follicle to function at optimal levels and produce hair growth at the normal rate the cells must receive adequate amounts of oxygen, nutrients, and minerals. Cigarette smoking has been shown to cause poor total body circulation, which can affect the amount of blood flow available to the hair follicles of the scalp. More specifically, scientists believe that smoking may actually disrupt or damage the circulation system that is responsible for delivering blood to the actual cells of the hair follicle. Another theory as to why smoking may increase the occurrence of hair loss is based on general health concerns. Smoking causes many illnesses and diseases, which can impair the functioning of other body systems. When the body is not healthy the organs do not function properly. Without properly functioning internal organs poisons, infections, bacteria, and other disease-causing substances are free to circulate throughout the body. These unwanted substances could further inhibit the hair follicle's ability to maintain the normal hair growth pattern. 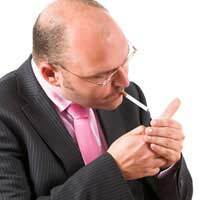 Smoking has also been shown to accelerate the ageing process and hair loss is often a symptom of ageing. Smokers already know that they face an increased risk of developing wrinkles, facial discolorations, and grey hair. Recent medical findings suggest that premature hair loss could also be added to the list of accelerated ageing symptoms seen primarily in smokers. The most effective way to avoid hair loss caused by cigarette smoking is to stop smoking. If you have previously tried to quit smoking without positive results, you should consult with your doctor to discuss ways to help you kick the habit. Many oral medications, patches, gum, and creams are available to help smokers beat their nicotine addiction and stay smoke free. Once you have stopped smoking, or even while you are in the processes of quitting, you can help fight the affects of smoking on hair loss by getting adequate amounts of cardiovascular exercise. Cardiovascular exercise, exercise that increases the heart rate, helps boost poor circulation. Strive to get at least 30 minutes of aerobic exercise at least five times a week in order to strengthen your heart and increase blood circulation. Did you know that alcohol can be a direct cause of hair loss in some people? Find out more in our feature Alcohol And Hair Loss.